Which rabbit(s) are you interested in? Please click on the image(s) of the rabbit(s) you are interested in adopting. If you just want to express your interest in adopting a rabbit, please don't select any of the rabbits shown. 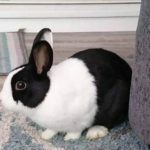 Are you looking to adopt to pair with a rabbit you already have? Is your rabbit to be an indoor or outdoor rabbit?